This class is organized and taught like our “Cocktails and Canvas” classes but with a new twist! We’ll be enjoying cups of coffee instead of wine, and watercolors will replace acrylic paints. Creating a “continental breakfast” ambiance to paint in, is our goal. 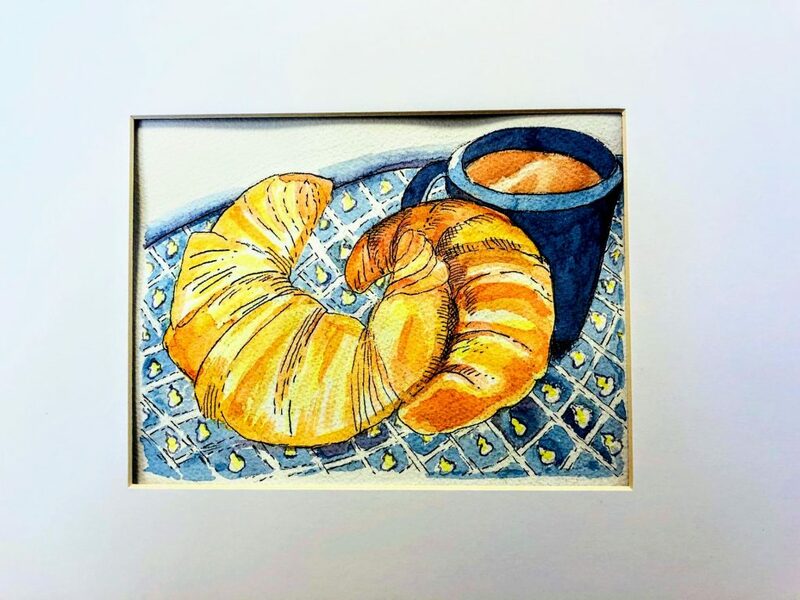 You’ll receive a sheet of fine quality watercolor paper (and a mat to place it in, when completed) with a still-life of the croissants and coffee lightly sketched in for you. Your paints are already pre-mixed from “Stockmar” brand watercolor concentrate, made in Germany; their colors have an unusual brilliance. Your instructor, Kate Lanxner, will guide your through the process: how to hold the brush properly, how to load the paint on the brush,not to make a “wash,” and how to achieve color luminosity through painting in layers. While your layers are drying, you’ll be able to enjoy your refreshments.